I am working on a sample chapter for the Wisdom of the Hands book, and what better project is there than a tool box. The tool box implies that the child will have his or her own tools. Even if the tool box is at some point used for other things, having tools of one's ownis a source of power. Tools are also evidence of trust, as in order to have tools, children must be trusted to use them properly, to care for them and to not use the power they hold for any but the right uses. Still to be added to this tool box will be places for special tools to fit, like screwdrivers and pliers. Places for pencils, too, will be provided. Some of the tools will be made in the wood shop. Writing is easy when all you have to do is show how to do things and describe the reasons why. My camera is my best friend in the wood shop. It records the steps, keeping them in the right order. They say that cameras don't lie. The photographer might. But in my case, what you see is what it is. This is the last day of 2017. Many things were good about this year. I met new friends in several places as I traveled to teach. We completed and opened the new wood shop at the Eureka Springs School of the Arts. My new book about box guitars was completed and published. We have been in good health. I want to thank all those who helped make my 2017 a special year. 2017 was also a year of greater than usual stress, turmoil and destruction. If you pay attention to the national and international news things are not so good. Special friends of mine send us a letter press holiday card each year that they print themselves. We have a collection of them at this point. Each is a work of art. The message inside this year's card offers good advice for the coming year. "If we would practice tolerance, we could achieve peace." May we do that, please. Let 2018 be the year in which bullies are peacefully removed from office and we begin the long slow march toward empathy for each other. Happy New Year! Thales c. 624 – c. 546 BC was the Greek Philosopher who was mocked for falling into a drainage ditch. “In gazing at and making observations on the stars, he fell into a ditch, and the people mocked him as one who had knowledge of heavenly objects and yet could not see what lay at his own feet.” The people laugh at such things, and boast that philosophers cannot tell them about such matters; but they do not understand that philosophers laugh at them, for they do not fall into a ditch just because they lie in one for all time, and because they cannot see what exists above them.— from Hegel's History of Philosophy. Would it not be best that students be taught to look both above and below? To learn by doing things that are real, and thence be challenged to contemplate the broader effects? Instead, we've divided them into two classes. One is judged capable of studying advanced things (mainly directed toward making money) and the other is ignored (unless its interest can be directed toward making money). Thales insisted that it was easy for a wise man to demonstrate making money, but it was of greater importance that he had proven the year to have 365 days. And so it is that we may be failing to direct young lives toward higher purpose. Today I plan to do a second coat of Danish oil on boxes, and to make a tool box as a demonstration project. I'll take photos of it step-by-step. The photo shows the laser engraving in the lids of the boxes I'm making for the U of A. Make, fix, create, and encourage others to learn lifewise. meeting the demands of a practiical life. A friend gave me a book, Educating through Arts and Crafts, a Waldorf education book edited by Michael Martin. I hope to read carefully through it, as the objectives are nearly the same as my own — that we recognize the fullness of the whole child and address the needs of engaging head, heart and hands in the fullness of whole life. Today nearly marks the end of my Christmas break. I take my daughter to the airport this morning so she can return to her life teaching in New York. When I get back, I'll sand boxes so they can be finished and delivered to the U of A. Then I begin charting my return to classes on Wednesday. We have boats to finish with the high school students, and fun things for the younger ones, also. The following is from Educating through Arts and Crafts. In the meantime, and in too many schools, children are asked to be manageable, and to sit at desks with hands stilled. Children want to be learning to do practical things for themselves, for their families and communities, and we must enable them to do so. Excessive gaming disorder has recently been named by the World Health Organization as a mental health condition. http://www.cnn.com/2017/12/27/health/video-game-disorder-who/index.html It is a disease that many children and adults have been suffering from for years and it was thought to be normal and OK or even desirable that children and adult sequester themselves relentlessly and for extended periods from real life. I am reminded of an article in Time Magazine in which one of their editors told about buying his daughter (2 years old) her first laptop computer. He said that "as an avid gamer" he was anxious to get his daughter in on the play. But then as a second thought, he decided to consult a child development expert. He nicknamed her "Susie Joykiller." She told him of the stupidity of his plan and of the well documented detrimental effects of early exposure to digital technologies. When the writer mentioned the wonderful hand-eye coordination he expected his daughter to receive, the child development expert mentioned scissors. While Susie's warnings made the author somewhat concerned about his plan, (and in the text he was honest about it) the article as laid out by editors featured a cute picture of his daughter with her laptop, and a guide to games that parents can buy for very young children, thus giving the impression that it was a wonderful thing to buy such things for your child. So it is with technology and tobacco. The warnings signs are buried so as not to interfere with sales. In the meantime, and despite millions of years or our species making beautiful and useful things, there are no mental health concerns about making. Useful beauty is the bedrock of civilization. In fact, playing music, involvement in athletics, making things in the wood shop, gardening, cooking, and all the normal things children did before the invention of all the digital stuff, are all good for your mental health. "So it seems reasonable to conclude that physics, astronomy, medicine, and all other sciences dealing with things that have complex structures are doubtful; while arithmetic, geometry and other studies of the simplest and most general things – whether they really exist in nature or not – contain something certain and indubitable. For whether I am awake or asleep, two plus three makes five, and a square has only four sides. It seems impossible to suspect that such obvious truths might be false." Sorry, René, the complexity of something (like the real world, for example) may mean that you do not understand it, or that you may be incapable of understanding it, but it does not mean it is not real. Human beings have a tendency to over-complicate things, and achieving simplicity is a worthy goal. But the denial of the reality of that which you do not understand is a frightful and self-deceptive launch of your meditations. My meditation for today... "If Descartes had a woodshop would we still be in the same mess we are in today?" I'm working to close the books and start with a new year, so I'm spending too much time at my desk. On my brief redemptive forays into my shop I've been working on boxes. To exercise my mind and limbs in doing something tangible and tactile in a warm shop on a winter day is like a vacation to a sunny beach, even though I've done it a thousand times before. The photo shows before and after of the initial sanding and routing operations. Make, fix and create. Assist others in learning likewise. We learn best and to greatest lasting effect when our hands take their traditional role in the learning process. Years ago, I observed that I might be most effective if I were to stand behind and promote that which appears necessary and inevitable. In that light, I decided an art guild in our community was necessary and called the first meeting to start one. I was elected president because I was the only person to show up with a pad of paper and pencil to take names. Years later, we closed the art guild to form the Eureka Springs School of the Arts, because that seemed necessary and inevitable. I promote an awakening to the value of hands on learning for the same reasons. It is necessary and inevitable. It is also simple. It requires teachers and administrators to ask one simple two-part question. "Am I putting the student's hands in service to their learning?" "If not, how can I do so?" The role of the parent, and policy maker is to demand that these questions be asked and answered. So what might the best answers be? 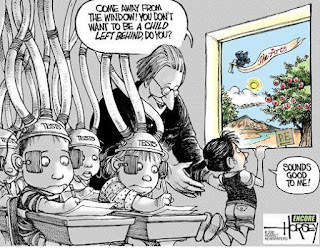 Music, wood shop, the arts, field trips, culinary arts, laboratory science, internships, nature studies, and so many of the other things children are no longer allowed to do in those schools that have become obsessed with the delivery of standardized education. The boxes in the photo are my capitulation to standardization. They are shown here in two sizes. After this photo was taken, I did the rough sanding on a stationary belt sander. Today I will rout the edges in preparation for further sanding exercises. The standards of finish and fit will be my own best. Make, fix, create and promote the value of learning by doing so. On the days leading up to Christmas I made a small gift box to hold a necklace wrapped up for my wife Jean. The lid is figured walnut and the lower part is bent elm only about 1/16 in. thick. It was incredibly easy for me to make, but making it required having the tools and materials on hand. As my wife suggested upon opening her gift, "you could sell these." And I believe I could. But could this not also serve as inspiration for you to make your own? And would that not be an even better thing? The making is simple. One sixteenth of an inch being the ideal thickness for a box this size, I start with thicker wood and saw it into thin slices on the table saw. 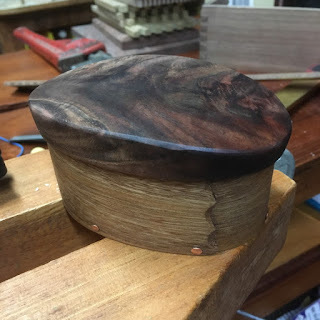 For this box the wood needs to be about 1-1/2 inch wide and about 16-18 in. long to pass safely through the saw. Two boxes can come from one strip of wood. Soak a piece of the resawn elm in boiling water for about 3 minutes to soften the lignin in the wood and thus making it flexible to bend. Wrap the wood into a coil and squeeze it in the vise or with clamps into an oval shape. When the wood has dried, it will retain most of its shape. Decorate the end that will be visible on the outside of the box, do some sanding where the ends overlap, and glue the loose ends together with one end over the other and glue between. Use 3/16 in. thick wood to form the bottom. Trace the shape of the box sides onto the bottom material so it can be cut and sanded to shape. Do the same to form a lid keeper that will hold the lid in place at the top of the box. Install the bottom using shaker tacks to hold it in place. Glue the lid keeper to the underside of the material you've selected to be the out lid, and shape it as you want it to look. I chose a dome shape, but no box needs to be exactly the same. There are, of course things that I cannot tell you: Things that you'd best learn on your own in order that your box reflect your own decisions, likes, character and relentless growth. Today I'll be assembling boxes for the Chancellor's office at the University of Arkansas. Join me in working with our hands. Make, fix, and create in service to family, community and humanity. "I suggested it could be used as a Nativity scene, but "No, that would not do," Anna said, "because they are dressed like nisser," and I think she meant it out of respect for the Holy Family. "A ‘nisse’ is a mythical being in Nordic folklore, and lived in the farm houses, typically in the barn. They were small (no larger than a horse’s head according to some), often dressed in colourful clothing (typically red) and were associated with winter solstice, and then Christmas of course, and ‘Julenissen’ in Norwegian is Father Christmas. They were considered as guardians of the farms and their inhabitants, unless you insulted them of course, which would make them mischievous. "One way of insulting them was not to leave them any porridge on Christmas eve (traditional part of Christmas meal), and my mother remembered her father putting a bowl of porridge out for the Nisse, and then firing one shot in the air with his shotgun (he shot for the porridge’ was the expression there) to let the Nisse know the porridge was ‘served.’ The shots from the different farms in the valley would be a sign of how far the different families had come in their Christmas meal. Well, that was almost a hundred years ago. "I just wanted to make that clear, since Anna was so adamant it was not a nativity scene, and she is right, they are nisser." We in the US might think of these as one would elves. They come in various shapes, ages and sizes, including one here in swaddling clothes and another requiring a cane. They have one thing in common. They each came through the creative mind of a child. The photo was delivered to me by Knud and now by me to you, in celebration of this day. Merry Christmas. Make, fix, and celebrate creativity before it slips away. Rousseau had said, put a young man in a wood shop, he will become a philosopher while thinking himself only a craftsman. A touch of humility (conveyed by the struggle to attain quality craftsmanship in the face of inevitable human error) would serve all philosophers well. In my case (and in the case of many others), the phrase rings true. While my hands do routine tasks that require only part of my attention, I think about the state of the nation, the state of education and what I need to tell my readers (or myself) about learning and the meaning of life. In light of this I came up with a brief list of occupations that require hands-on learning and you are welcome to suggest others to add to my list. While some may suppose hand work (even when well rehearsed) to be mindless, it is not. I can go on. Are there any in the list who are not necessary to the quality of life we enjoy? Are there any in this list that are unnecessary to our economy? And now I'll go on to list a few that you may have assumed are unrelated to hands-on learning, but even these, for the sake of society at large would best be educated hands-on. Given this list, would it not make sense to place the hands at the center of American education? To leave the hands untrained, sequesters our children from realizing their full capacities of mind, hand and creativity. This is Christmas eve, the very last making day before Christmas. May your own joyous holidays bring peace of heart, mind and hand. Regardless of which you prefer, Moody Blues, Carlin or Descartes, the line spells trouble for humanity, in that it fails to grasp the active role that man must play in the harmonies of life. 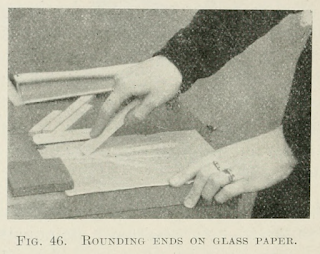 In the early days of manual arts training, educational policy makers were concerned that the motions of the craftsmen might be mindless and devoid of thought. Little did they consider that thought itself might be just as mindless and devoid of meaningful content. There are special things that happen when hands are placed in service to family and community. Care is expressed, and in caring, even through the smallest acts of it, the fabric of society is woven tight, and given warmth and strength. "Whatever I have accepted until now as most true has come to me through my senses. But occasionally I have found that they have deceived me, and it is unwise to trust completely those who have deceived us even once. "Yet although the senses sometimes deceive us about objects that are very small or distant, that doesn’t apply to my belief that I am here, sitting by the fire, wearing a winter dressing-gown, holding this piece of paper in my hands, and so on. It seems to be quite impossible to doubt beliefs like these, which come from the senses. "Another example: how can I doubt that these hands or this whole body are mine? To doubt such things I would have to liken myself to brain-damaged madmen who are convinced they are kings when really they are paupers, or say they are dressed in purple when they are naked, or that they are pumpkins, or made of glass. Such people are insane, and I would be thought equally mad if I modeled myself on them. You may be intrigued as I am of Descartes' reliance on his hands in the assertion of his own reality. 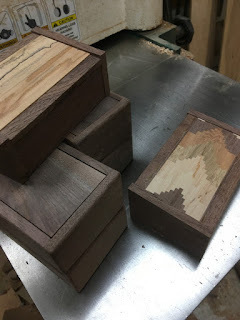 As I continue to make boxes and to teach, some of the steps gradually fall away, reducing them in number to get the best results with fewest opportunities for mistakes. The photo shows two simple devices used to make better boxes. How much better is it to know we are real when we do things that are real, thus affirming our reality to others as well as ourselves? Lots and loads. Make, fix and create... Do so and perhaps some nagging questions about the meaning of life will become unnecessary. It was once known and widely accepted that the developments of hand and mind were concurrent and mutually dependent. But then, we as a society took a left turn off the deep end of empty imaginings. Now children are introduced to iPhones that do all the thinking for them before they know how to use scissors. The following is from Sir James Crichton-Browne, called by some, the last of the great Victorians. "Depend upon it that much of the confusion of thought, awkwardness, bashfulness, stutterings, stupidity, and irresolution which we encounter in the world, and even in highly educated men and women, is dependent on defective or misdirected muscular training, and that the thoughtful and diligent cultivation of this is conducive to breadth of mind as well as to breadth of shoulders." If we fail to understand that training the hand is training the mind also, what does that foolish experiment in excessive digitality mean for our children? Today I am slowing down and attempting to keep my feet up, after having a toenail removed due to having dropped a 25 lb. weight on my toe. Ouch! My boxes are proceeding as shown. Make, fix, create and increase the likelihood that others learn likewise. 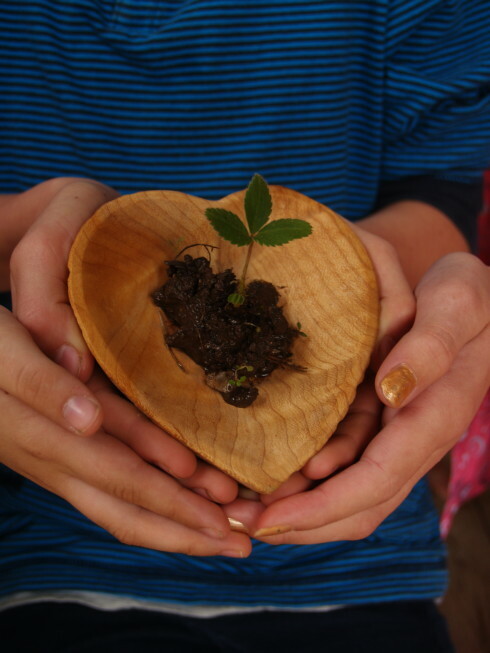 Richard Louv, author of the book, Last child in the woods: Saving our children from nature deficit disorder is offering charter memberships in a new organization intended to encourage the engagement of children in nature. 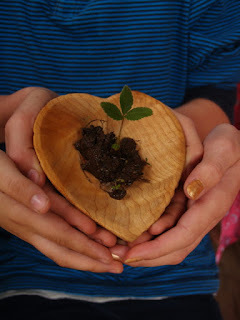 https://www.childrenandnature.org/2017/12/18/finding-our-place-in-the-universe-this-holiday-season-giving-the-gift-of-the-stars/ It's surprising how just a small bit of nature and engagement in some very small part of the natural world can have a startling effect. When I was a very small child in Memphis, there was a bit of unused and undeveloped land (much smaller than a lot) on our block that had not been filled in and leveled as had been all the rest. In those few square feet of unattended property there were a couple trees, a few wild shrubs and a grapevine hanging from one of the trees. So that became "Tarzan's Paradise" for my sister and me. We would grab hold of the vine and swing out over the uneven forest soil. Surely civilization has caught up with and destroyed that spot. If it was on some map at one time or another, it could no longer be found. And so it goes with the destruction of the natural world. Human reshaping of the natural world is relentless and not necessarily a good thing. 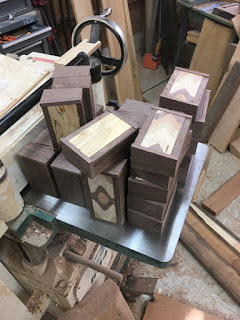 Yesterday I inlaid 30 box lids, and milled many dozens of parts. Before I became distracted by writing and teaching, making boxes and making custom furniture was my full time life. And so during Christmas break from the Clear Spring School I am temporarily back to my old ways. To work on a cold day in a warm shop, doing things that are deeply ingrained by practice in my mind and hands is a deeply satisfying process. Who would think of work as vacation from the cares of the world? The craftsman. 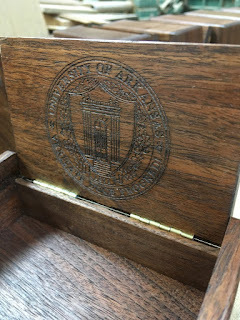 I delivered sixteen inlaid lids to a friend for laser engraving, and when that's done, I'll assemble those lids into boxes for the Chancellor at the University of Arkansas to give as gifts to special guests. The rest of the boxes will be added to my inventory to be sold when orders come in. The point of this book is the making of box guitars, but in this case, the reader gets to make his or her own box. Yesterday I received a box of books from Springhouse Press with first copies of my new book The Box Maker's Guitar Book. It is a lovely book that I hope will inspire many makers of box guitars. I want to thank my publishers for the opportunity to write this book, and thank the editors, artists and photographer who helped in its creation. A good book is always a team effort. Knowing how to get along with others and work with others is one of the most important skills we have as human beings, and one of the particular skills we should emphasize in schooling. Team athletics can help, as can building projects, as can instrumental music and choir. Woodshop, too, is a team effort. And while interpersonal skills are rarely considered in standardized tests, their development should take the lead in all things. Teachers, too, should be led toward collaboration and teamwork. In fact, we would be a more cooperative and compassionate nation if we placed less emphasis on individuality and more on community. We would be a happier nation if we were to do so. Taunton Press is having a Christmas sale. Customers can use the code Gift20 to get 20% off on all orders. This is a great chance to save on my books and books by other great authors! In addition they are offering a special package deal on my book Basic Box Making and the related DVD for a special price of $23.94. Use the discount code of Gift20 for an even greater holiday savings. I first ran across this quotation from African environmentalist Baba Dioum displayed on a large wall in the Henry Doorly Zoo in Omaha, Nebraska. I realize that most of us have become dependent on our technological devices to the point of addiction and we need constant reminders that there is a real world out there. As we spend more and more time attuned to screens of whatever size, we attend less and less to the real world that surrounds us. For that reason we must develop means to attract young people and young adults into the wilds so that they become more deeply engaged in the real world. The consequences of carelessness are dire. What does it mean to be "taught?" In the classic school model, a professor stands at the head of the class and lectures at his kids: what they are to know and who or what they are to become. True love does not come from being preached at. It comes from volitional engagement. So that's why we are building boats. It's not just about development of skill or proficiency in math. When the boats are finished they will be put on the water in the real lake, and each child will have further experience leading them toward deeper understanding. The high school and middle school children will learn to row and control the boat. The elementary school students will have a chance to ride out into the water. All will experience a deeper sense of engagement in the natural world. Does this make sense? If we are to live, we must learn to protect the world in which we live. In order to do that we must learn to love the wild places and the nature upon which we depend. If you don't understand that, put down the iPhone, look around and think about it. First copies of my new book, The Box Maker's Guitar Book will arrive from the publisher today. We have about 6 making days before Christmas. Lovely handmade gifts are appropriate at any time. The following is one of two five star reviews from Amazon.com of my book Making Classic Toys that Teach. The book can be acquired from Amazon in 2-5 days, still leaving you time to make timeless heirloom educational gifts for your children and grandchildren, just as parents, grandparents, teachers and village craftsmen did over 100 years ago. Will got the point. Learn woodworking and be of service to your child's growth, while also learning about child development, how we learn best and a bit about the history of education at the same time. Use this link: https://www.amazon.com/dp/1940611334/ to order your copy. The point is simple. Children and adults learn the same way, by doing real of things of real meaning. What could be more meaningful than making gifts that impart wisdom. Make, fix and create...Assist others in learning likewise. We have less than 10 days before Christmas and the time is running out for big projects. But some things don't take as long as one might think. With just a few tools, some materials and inspiration, a simple gift can be simply made. Yesterday was the last day of school before the Christmas holiday, so I asked my upper elementary school students to assist in cleaning the wood shop. Where there's lots of sawdust on things, cleaning can be a pleasurable task. They wanted to take turns with the vacuum cleaners. (I brought an extra from my home shop.) As a reward for their service, I had a gift drawing, allowing them to choose from some things I had done as demonstration projects (turned pens, fidget sticks and a turned object I identified only as a deely bobber.) The students drew numbers from a box and were able to choose in order of the number drawn. The student who got the deely bobber asked, "can I turn this into a candle stick?" "Of course." At one time, deely bobber and doohicky were synonymous, meaning objects that had no apparent purpose or whose purpose could not be described. Then, in 1982 a company trademarked the term deely bobber to mean a headband with two balls attached on springs. I use the term in reference to its true and original meaning: An object with no apparent use. Apart from doing progress reports on each student, I can now apply myself to other things. I have an order of boxes to do for the University of Arkansas, supplying them with gifts to give to visiting dignitaries. I will begin making those today. Yesterday we got the keels installed on Bevins Skiffs, leaving me with the skeg, foredeck and quarter knees to complete on my own before painting. Copies of my new book, The Box Maker's Guitar Book will arrive here on Monday and should be showing up at Amazon.com some day very shortly thereafter. 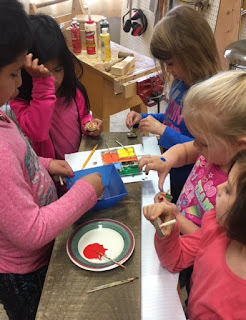 Wendy, our art teacher at Clear Spring School, introduced a boat project using water colors and torn paper in the lower grades to collaborate with our high school boat building project. Students learned some nautical terminology, and learned a variety of things about art at the same time. The results are delightful and are what you get when a teaching staff has the opportunity for all to work in collaboration with each other. What you see in the photo is first grade art and first rate. No, those are not catamarans, or catboats. They are sailing cats. 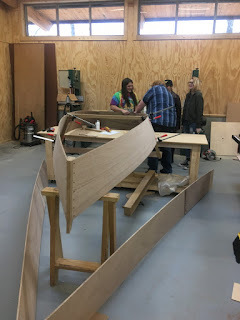 Yesterday at ESSA I scarf joined the white oak to form the keels of the two Bevins Skiffs. My students finished installing the top rails. Today I hope we can get the keels and skegs installed. This is my last day of school before the Holiday break. Yesterday I asked my students to name a few specific things they were learning by building boats. One they mentioned was teamwork. Teamwork is a skill and resource they will use all their lives. Yesterday we had a plumber here working on our propane line. I noticed that he was wearing a VICA jacket indicating his participation in the Skills USA national competition, so I asked about it. He told me about winning first place in the state competition in plumbing and having gone on to the national competition. He told me too, that without the shop class at Eureka Springs High School he would not have graduated from high school. He told me that the problem with all his other classes was that they weren't doing anything real, and that when he was doing something real, the rest of it began to make sense. Can we fix things, please? Every student should be afforded the opportunity to learn by doing real things in service to family and community. It is distressing that so many children are being controlled by gaming platforms and iPhones when in the past, kids were left somewhat to their own devices (of hand and mind) to discover their creative capacities. Girls, too, need to be engaged in doing real things. Community Playthings is a company in New York that makes wooden furniture, fixtures and teaching supplies for schools and pre-schools. The workbench in the photo is one of their fine products. Make, fix, create, and allow others to learn likewise. I intended to install the seats of the boats yesterday, but my students got started sanding. They like that part. We did begin installing the rails. The parts that remain are the foredeck, the quarter knees, the keel and skeg. We may leave the seats for last, giving us the opportunity to paint the insides without obstruction. I will need to scarf join some white oak to form the keels. Of all things, living or lifeless, upon this strange earth, there is but one which…I still regard with unmitigated amazement…and never pass without the renewed wonder of childhood,…and that is the bow of a Boat…The nails that fasten together the planks of the boat’s bow are the rivets of the fellowship of the world. Their iron does more than draw lightning out of heaven, it leads love round the earth. — John Ruskin. John Ruskin was a critic of art and architecture whose writings inspired the golden age of arts, crafts, and craftsmanship. Today, if all goes right, we will install the seats in our Bevins Skiffs. Still to come will be the keels, skegs, foredecks, and quarter knees. I have students on my hands now who can hardly wait for the time when the boats hit water. Yesterday I ripped catalpa wood for the balance of the parts for the Bevins Skiffs. I cut scarf joints on the table saw to extend sections of 8 foot stock to over 12 feet. I used epoxy glue thickened with wood flour to secure the joints. This stock, after being planed and cut to width and length will form the seat risers, and top rails. Today we can begin installing the frame pieces to which the seat risers and rails will be attached. The Incra (brand) miter gauge shown is perhaps the only table saw miter gauge that can be adjusted to such an acute angle (7.5°) to form a scarf joint in this manner. My objective is to have most of the woodworking completed on both boats before the end of this week when students (and teachers) get out for the holiday break. There may be a few small details that I'll need to attend to when the students are not present. Painting will come later. I will need to turn some of my attention during break to getting the ESSA wood shop ready for classes in the spring. The simple point is that students need to be engaged in doing real things. There must be real things offered in school for which they find pride in having done and through which skills of mind and hand are attained. Even if we were no longer a manufacturing nation — even if we were overrun with meaningless stuff (as we are) — being a human being requires that we create useful beauty in service to each other. To fail to do so may leave us short-handed, short-sighted, ill-tempered, anxious and depressed. Some days I have to sit back and attempt to make sense of things. Again, along the same lines, the following is from Dr. Matti Bergström's book, Hjarnans resurser — en bok om ideernas ursprung "The Brain's Resources — a Book about the Origin of Ideas." It seems the human condition requires great effort to make sense of. While our training and relentless activity is to discern one thing from another, the understanding of wholeness, a thing Froebel called Gliedganzes, requires us to put things together and to find the common thread. An ancient Chinese text called the Hsin Hsin Ming describes the process and the solution. "The great way," it says is, "is not difficult for those who have no preferences, but make the slightest distinction, and heaven and earth are set infinitely apart." The solution it proposes is that whenever doubts or dissensions arise they must be met with the firm assertion, "not two," that there are no real boundaries between us. The night was clear, bright, and starry, as they drove home from Inselsberg to Liebenstein, and the beauty of the heavens had set them talking. "No one of the heavenly bodies is isolated; every planet has its centre in the sun of its system. All the solar systems are in relation and continual interaction with one another. This is the condition of all life — everywhere mutual relation of parts. As there above, in great things, unbroken connection and harmony rule, so also here below, even in the smallest thing; everywhere there are the same order and harmony, because the same law rules everywhere, the one law of God, which expresses itself in thousand-fold many-sidedness, but in the last analysis is one, for God is himself the law." "That is what people call pantheism," remarked Diesterweg. "And very unjustly," rejoined Froebel; "I do not say, like the pantheists, that the world is God's body, that God dwells in it, as in a house, but that the spirit of God dwells and lives in nature, produces, fosters, and unfolds everything, as the common life principle. As the spirit of the artist is found again in his masterpieces, so must we find God's spirit (Geist) in his works." Have you not yourself, walked with friends along a pathway in a starry night and wondered at the billions of stars and the interrelationship between all things? You need not be religious to do so. Make, fix, and create. Use the powers of mind that you have been given to transcend the fractures that divide us and that leave us lonely and afraid. 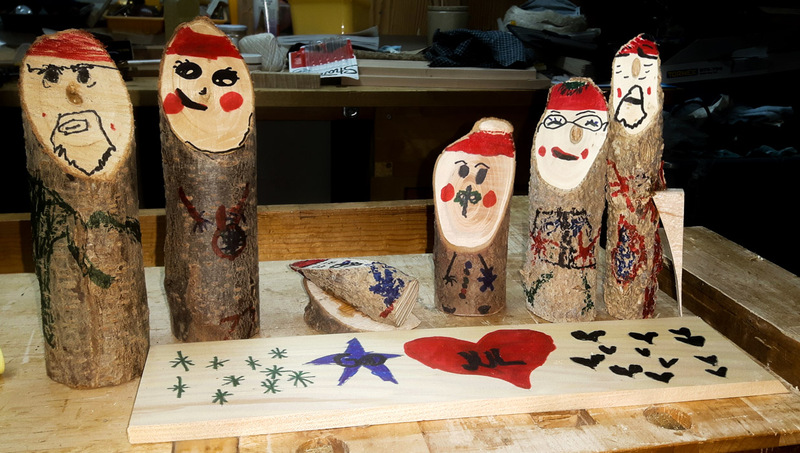 Yesterday my upper elementary school students turned wood on the lathe, making small candle sticks as Christmas presents. 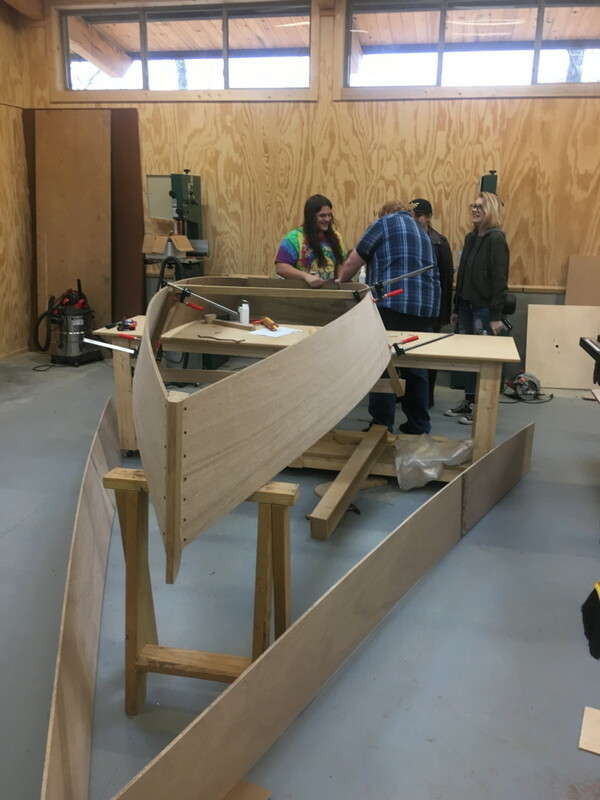 My high school students began work on the insides of the Bevins Skiffs, forming the ribs that support the seat risers and strengthen the sides. Fitting the ribs was perplexing at first until it dawned on me that all the chines were cut on the top edge at the same angle and were the same thickness of wood. 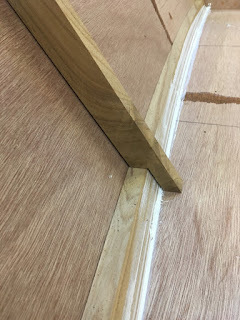 So all we had to do to get them to fit was to make a bandsaw cut into the end of each and then use a sliding t bevel and pencil to mark the angle cut for it to fit the top edge of the chine. Making the final cut required using a pencil and thin shim to cut the end to angle and length. The students quickly picked up the trick and the process that they believed would take hours was quickly done. By the end of this process I will have learned a lot. In contemplating a career for myself, I had wanted to do something that provided constant learning. Woodworking can be that. 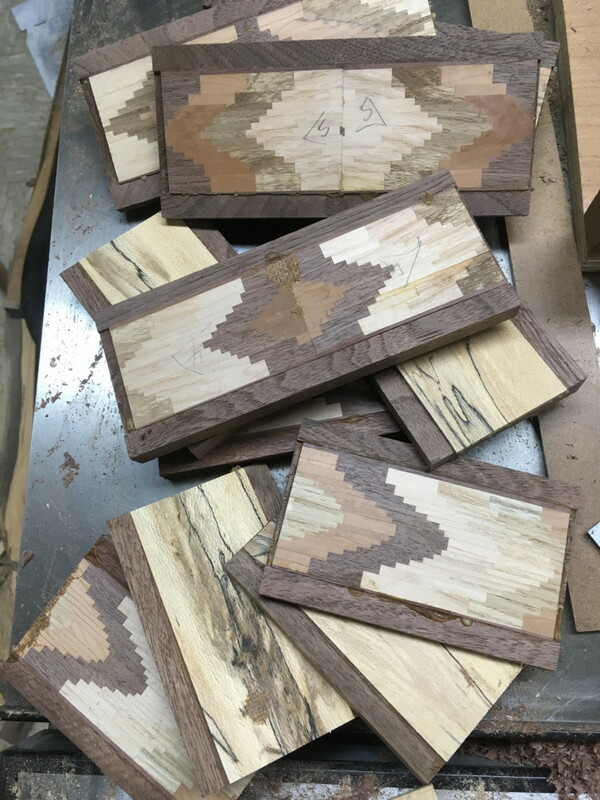 Over the weekend, I'll prepare more stock by taking pieces of catalpa and scarf joining them into longer strips for the seat risers and top rails. This evening I will be at Lux Weaving Studio for a sale of my work. Years ago when I presented at a conference in Little Rock, an artist came up to me and told me that she had purchased woodworking tools for her grandson but her daughter-in-law had refused to allow them in the house. Her concerns were that he might make a mess, or damage her furniture. Perhaps he might even injure himself. So what's a wise grandmother to do? Keep the tools in her own house and claim the child whenever possible so that he (or she) can create and learn. Yesterday at ESSA we finalized the 2018 program catalog, and course offerings for the coming year will begin showing up on-line. If you want to receive a catalog, please contact the school through the website, essa-art.org. In the ESSA woodshop my students and I trimmed the edges of the marine ply forming the bottoms of Bevins Skiffs. This morning we will continue the same work, and by Monday we will be ready to work on the insides of each boat. Make, fix and create... Make certain, too, that real skills are passed along to fresh generations. Book and DVD package deal. Taunton Press is having a Christmas sale. Customers can use the code Gift20 to get 20% off on all orders. This is a great chance to save on my books and books by other great authors! In addition, Taunton is offering a special package deal of my book Basic Box Making and the related DVD for a special price of $23.94. Use the discount code of Gift20 for an even better holiday savings. Many of my readers have told me that the DVD Basic Box Making is a classic that they watch again and again. The processes illustrated in it are useful for understanding the processes used in my other books, as well. 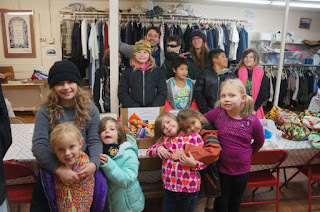 Yesterday at the Clear Spring School we took a field trip to the local Food Bank to deliver toys for holiday distribution. Our students made tops, button toys, super heroes, and toy cars, as well as an assortment of other things that came from their imaginations. Make, fix, and create. Use craftsmanship as a celebration of your life. Chines are the parts of a boat that run along the bottom edge of the sides where the bottom is attached. Yesterday we installed the chines and began the process of planing the bottom edges flat so the bottom sheets can be tightly secured and sealed with no leaks. The photo shows the process. Turning the process over to kids and keeping two boats going at once, does not allow for the level of finesse I would hope for if left completely on my own. But perfect boats is not the goal. A perfect learning experience is. Otto Salomon had suggested that craftsmen would not necessarily be the best teachers of educational Sloyd, as the objective was not perfect or efficient craftsmanship. Joy of learning is a far better goal. 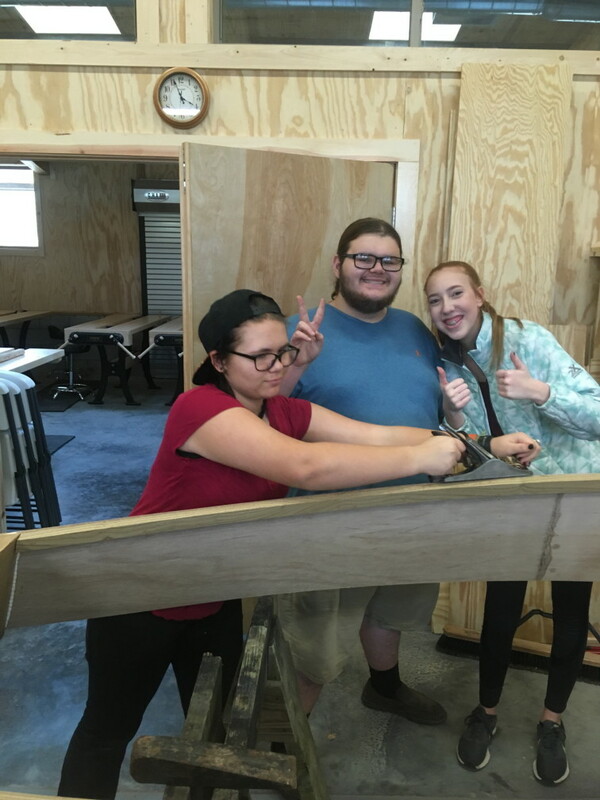 On the first day of boat building, I told my students about my first boat. I used a sheet of 1/4 in. plywood, as it was all I had, along with 1 x 2's and 2 x 2's salvaged from construction scrap. Where I had gaps in the construction that I did not know how to close, I used a tube of window caulk. My dad was very complimentary of my work and we put the boat on a rack on top of the car and took it to Carter Lake in Omaha, Nebraska for its maiden launch. The window caulk immediately gave way even before I could seated with the oars. The boat went straight down in shallow water. My dad, surely knew in advance what would happen with the window caulk, but he made no comment or criticism about my failure. We loaded the boat back on top of the car, took it home, and it became a sand box for my little sister. Being a good teacher is more important than being good craftsman. The things a craftsman makes may serve until their beauty and utility are worn away. The things a teacher imparts, may last beyond generations. As you can see in the photo, parts of the Bevins skiffs are coming together to look like real boats. My students are very excited about the process. Yesterday we attached the transoms, and got the center frames roughly in place to give the boats their shape. We also laid out the shape of the bottom and got one cut to shape. Today we will fit the chines. The chines are strips of wood nailed along the bottom edge of the sides that provide a place for the bottom plywood to be nailed on and sealed. After the chines are nailed on, they and the sides must be planed flush so the bottom plywood will fit tight. I am grateful to have use of the new wood shop at the Eureka Springs School of the Arts to build these boats. Richard Bazeley sent a link to an article explaining why sets of blocks are still the best Christmas gift. 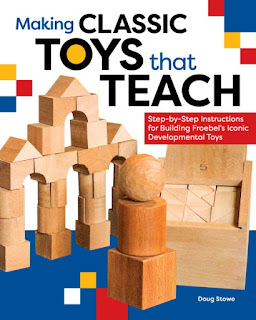 https://theconversation.com/blocks-are-still-the-best-present-you-can-buy-children-for-christmas-87171 Last year I made a set of Jenga blocks for the lower elementary school students to use in learning their math facts. Before pulling a block loose the student had to answer the math problem written on it. The new way and more exciting way is for the kids to claim Jenga blocks for building stuff. If they can answer the math question written on it, they get to use it to build. Our students are competitive in wanting to gather the most blocks to then have the most supplies to build with. Our high school students are also competitive. One asked, "When the boats are done, can we race?" Of course they may! 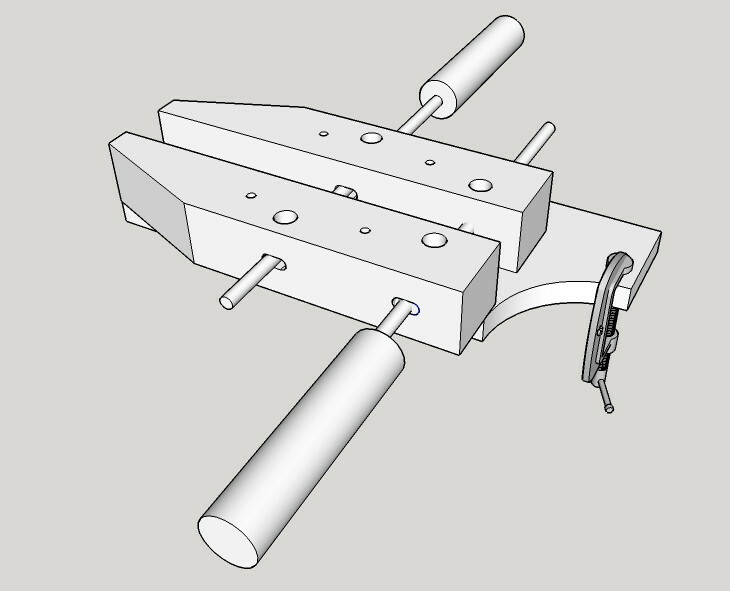 The photo shows my new desk vise based on a common woodworker's hand screw. It can be easily and cheaply made and allows students to do woodworking in a conventional classroom, using tables or desks. 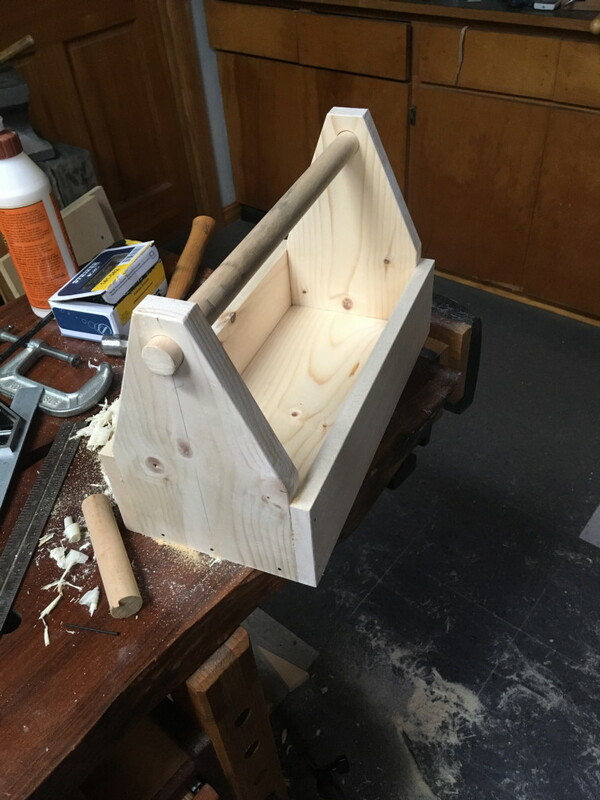 It can hold wood for sawing, drilling planing and assembly. I will have my students at the Clear Spring School test it to make sure it works. The one difficulty I anticipate is that the screws work at cross purposes to each other and take some time to figure out. The desk vise will not be as easy to operate as a common wood working vise. Today will be a busy day. I have high school students in the morning to begin our unit on boat building, and my elementary school students will work on Christmas presents in the afternoon. We are down to about 22 making days before Christmas. I asked a good friend of mine to help me think though the various issues we must address in improving public education. Of course making education hands-on so it actually interests kids is only a part of the equation. My friend pointed out that education in the US once had a common, accepted purpose, that of creating a democratic nation in which people found a meaningful place in the fabric of society, got along with each other and knew how to resolve their differences without damaging the rights of others. As we wandered from that path and chose lesser goals, we've become a nation of sides in opposition to each other. We see this locally in our city council meetings, and attitudes towards each other, and in states where voters would rather elect persons with despicable moral failings than a person of the other party. On the national stage, one party joyfully pass legislation completely at odds with the wishes of the opposing party. 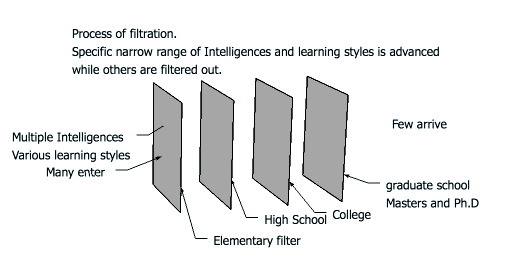 My illustration shows what I fear has become the accepted purpose of education in America. Can we go back to Kindergarten and learn in some remedial fashion the things we should have learned then, but missed or forgot? Things like, how to get along with each other, how to share, how to speak kindly, to act thoughtfully and with consideration for each other's feelings? How to nourish and sustain each other and help each other to do our best? "Less restrictions, or more freedom in choosing and developing curriculum aimed toward perpetuating and improving our democracy. More interest in ‘Honesty” and ‘Integrity’ being shared values than just words of the week." Today I have lots of preparation to do for Monday's classes. It is claimed that the correlation, connectedness, and continuity... materially adds to the educative value of this scheme of simple woodwork; for by its aid the necessity of absolute truthfulness and accuracy in definition is most strongly emphasized: it tends to creativeness; it stimulates latent inventive faculties, quickens perception, guides and directs on correct lines the natural impulses of child nature; and, whilst demanding close attention to and Observation of detail, it trains the little fingers to deftness and skill in execution without detracting in any way from the established methods of the greatest thinkers and exponents of educational reform. The book, "Learn By Doing" Simple Woodwork Designed on Froebelian Principles by Joseph Henry Judd is full of lessons, commentary and wonderful illustrations of tools and processes. The photograph above shows a technique familiar to my students at the Clear Spring School, using sandpaper on the bench to sand parts. My role in Scott's Kindergarten documentary project is to explain the interrelationship between the worldwide Kindergarten movement and the rise of manual arts training. This old book, when shared, will help to further an understanding of that relationship as does a journal published in the UK during the 1880's and 1890's called Hand & Eye. My new hand screw desk vise will make clear how woodworking can be done in any classroom equipped with tables or desks, thus removing one of the excuses that schools may have for not reintroducing woodworking to their students. Please join Eleanor Lux and I at 18 White St. Eureka Springs, this evening from 4-8 PM for a show and sale of our work. Today in the wood shop at the Clear Spring School, my high school students will be working on a variety of projects. My older boys have been enjoying turning wood on the lathe and are testing their own skills to develop the smoothest objects they can. It is odd that at a certain point in development students begin to focus very strongly on the texture of things. My youngest students take delight in finishing their work in bright colors. My older students develop an interest in the textures of things and the natural colors of the wood. I know that part of thir interest is that while so many factors in design are rather nebulous and abstract, texture is not. 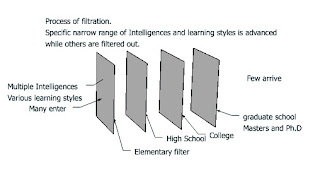 We have the ability to easily discern one gradation of surface smoothness from another. And my students have become interested in achieving their best. Does this apply to other things in life? Feeling for irregularities in touch, leads them next to observe closely with their eyes, and then often leads to starting over with a lathe tool or coarser sanding grit. In the process, are they not refining themselves as well? 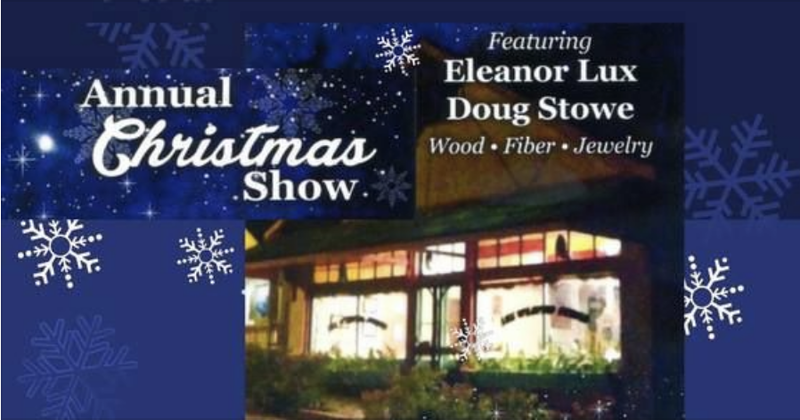 You are invited to a show of work at Lux Weaving Studio here in Eureka Springs, both tomorrow and on December 9, 4-8 PM. The address is 18 White St. We will have wonderful Christmas gifts for sale. I have been reading the guidelines written for school board members. Apart from those guidelines are told we need charter schools as an official state sponsored means to shake things up. (Because it is widely agreed that public education is not measuring up to expectations). In the meantime, local school boards and schools where some meaningful shaking up could be most easily accomplished, are strictly held to the dotted i and crossed t. Evidently, among governmental policy makers, shaking things up is OK if done in a corporate board room, or by a major private foundation but not OK if done on the local level where it is probably true that people care about real kids. This following is a description of the duties and responsibilities of a local school board in Arkansas. Maintaining and operating a school district is, in a very real sense, a partnership between the state as parent and the local school board as offspring (or child?) Throughout the nation, this arrangement has proved its merits: It keeps schools close to the people, stimulates wholesome and creative flexibility within schools, allows for adaptability to local needs, and promotes working toward equitable opportunity without imposing uniformity that could stifle creativity and experimentation. In my view, the constraints placed upon school boards, allowing them only to manage the financial concerns of the district, and whose only accepted duty is to hire and fire the superintendent is the cause of the situation than then provides justification for the charter school movement, which then takes public education out of the control of local school boards and puts it in corporate hands (that then do a very poor job of it). The key phrase above states that the local board is the "offspring" of the state. Malcolm Gladwell and others have written about the 10,000 hour rule that proposes that it takes 10,000 hours to develop a particular level of expertise, whether in music, the crafts or computer programming as was the case with Bill Gates. By the time students have been sequestered from the real world outside for over 10,000 hours of instruction, most will have become good at nothing. Nada, Zip, etc. unless they have been lucky enough to have become engaged in school sponsored athletics or in a school that breaks all the rules that must be adhered to in most public schools. Is it any surprise that when it comes to comparing high school basket ball games to conference night we find that parents show up for one and not the other? I call for greater control at the much more local level over such things as curriculum development and measure of school success, allowing schools to be more flexibly responsible to the needs of each and every child. The Parent/child relationship should become more like when your child goes off to College… In which a responsible state steps back and asks only of local boards, “What can we do to help?” Instead, we have a educational system that assumes the local folks are unqualified to make educational decisions that affect the lives of their own kids. Yesterday I attached the stem and sides of the Bevins Skiffs in order to be ready to proceed with students on Monday morning, the first day of a boat building block. Up to this point, there were so many things that required my thinking through. Now with this preparation work done, many hands will make light work. 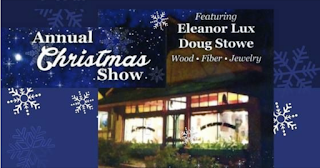 On Saturday I'll be at Eleanor Lux Weaving Studio for a Christmas sale of my work. Yesterday I prepared enough materials for students to make about 50 tops, and laid out small dowels for them to use to apply paint. My students exhausted my supply and I had to rush between classes to make more. 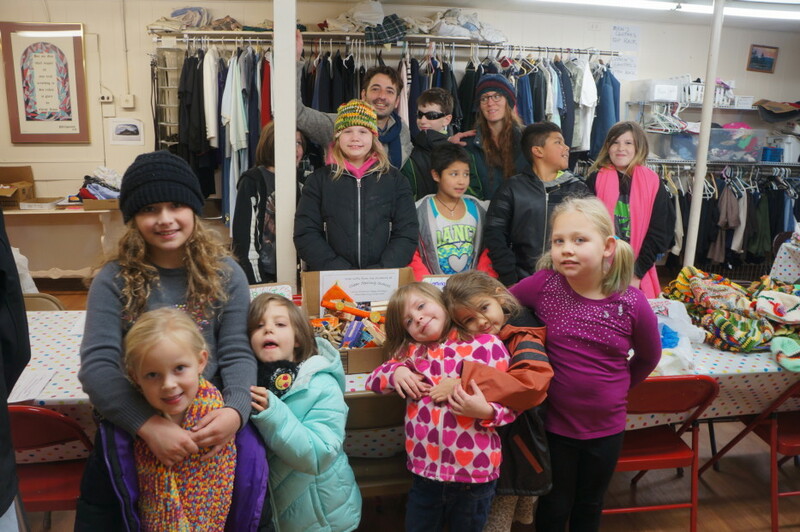 The idea was to make tops as toys for children at the food bank, but with each child making one to keep and then needing gifts for family, most were taken home. What remained are shown in the photo. The tiny Singer machine is being put to use in the lower elementary school classroom with the students making tiny pillows. In the meantime, the world is drowning in garbage. https://www.washingtonpost.com/graphics/2017/world/global-waste/ It is the consequence of a world-wide consumer culture in which we buy meaningless stuff we think we need instead of being able to make what we need for ourselves. In the making of things greater meaning is found. When we make beautiful, useful and lasting things, we have a better understanding of the value of the materials and effort required. We then make things to last and for which we take care and find lasting meaning and value. I am home in Eureka Springs after a quick Thanksgiving trip to Denver. In addition to Thanksgiving dinner with family, we visited the Denver Art Museum n Denver Public Library and were most impressed by their attention to activities for kids. If we are not providing interesting real things for our kids to do and to learn from, we are failing our future. Too much time is spent sequestered from reality, which brings me to the subject of school and where woodworking can fit in. Everyone these days is interested in virtual reality (which is not at all virtuous) and artificial intelligence (which is actually quite artificial and no one seems concerned about it). In the meantime, we get the big picture of things on the small screens of our iPhones, and know far too little about the actual real world that surrounds us. Coming home across Kansas yesterday morning early with the sun yet to rise it seemed as if we were in a magical paradise of earth and sky. My wife asked me more than once, to "take a picture of that." The beauty was breathtaking. The land was flat enough, that it seemed we could observe the curvature of the earth, and that we were surrounded by a golden valley of earth and sky, but that we might never really know which was which. Of course, no phone could ever take a picture of that. The point, of course is that in schools, children need to do real things that pertain to real life. 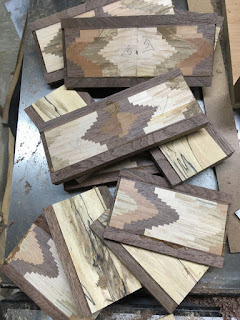 Woodworking connects the child to a deep heritage of human development and culture. The fact that the materials come from the forests of our own communities give the child insight into nature that will not be gained from the manipulation of on screen data. The world seems to have become addicted to tiny screens, when we need most to become more closely attuned to the real world that surrounds us. I am working on a slide show to bring my high school students up to date on my preparation for building Bevins Skiffs. The slide show is just a glimpse of the making. The iPhone photo of the Kansas sunrise is not the real sunrise, and schooling in general is too often a means of sequestering children from reality not preparing students for real life. Today I have a full day of classes. Included in the translation are Rose Ann's notes regarding the meaning of certain words and their relationship to english. Watch for the word scarf, as that is what I've done to join the pieces of plywood in preparing to assemble Bevins Skiffs. Amidst the litany of what the hands do, it is important to realize that they also shape the way we think and who we are. Perhaps as this movement happens, it will also carry with it a resurgence of interest in crafts and craftsmanship just as it did in the 1970's when it carried young college graduates like me to places like Eureka Springs to fulfill the intention of building more meaningful lives. "Being a genius is different than merely being supersmart. Smart people are a dime a dozen, and many of them don’t amount to much. What matters is creativity, the ability to apply imagination to almost any situation." The article describes Da Vinci's insatiable curiosity. It also told how the answers to persistent questions often result from a willingness to ignore conventional wisdom and to look directly at reality as it presents itself. "So it was that da Vinci learned to challenge conventional wisdom, ignoring the dusty scholasticism and medieval dogmas that had accumulated in the millennia since the decline of classical science. He was, by his own words, a disciple of experience and experiment–“Leonardo da Vinci, disscepolo della sperientia,” he once signed himself." Just this brief article should open eyes in education. If we want our children to be creative problem solvers, we could do something about it. Music, laboratory science, wood shop, field trips, internships and more should be added to the public school plan. That which is learned hands on, is learned at a deeper level, having holistic effect. It is black Friday and a good day to stay away from the shopping frenzy. It is a good day to hang out in the shop, planning gifts that you can make. Happy Thanksgiving. 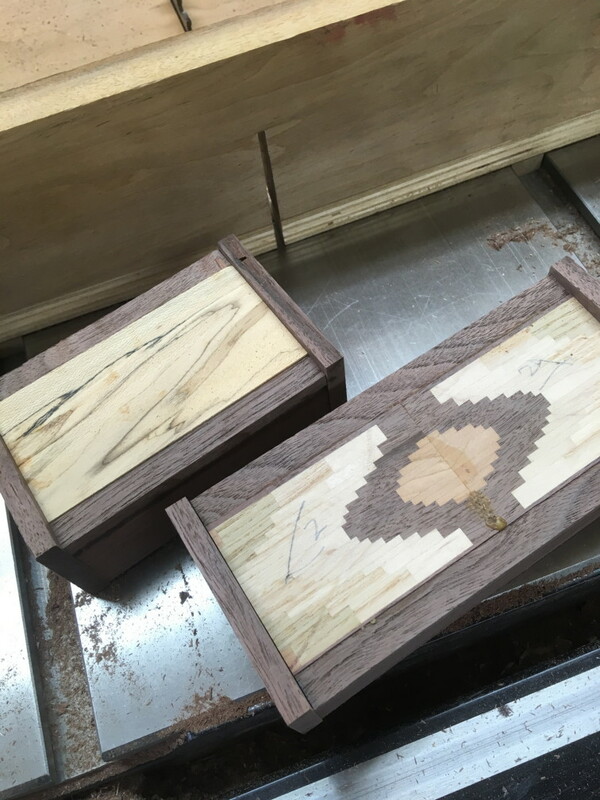 You may have noticed that I've been working on gifts for you in the form of designs for safely holding wood. For someone with both welding and woodworking skills, this vise would be useful for attaching to table or desktop, and hold wood safely for being cut. This style of vice is named after Joseph Moxon who wrote the Book of Trades, a classic from the 17th Century. Woodworking can be done safely in school and at little cost in comparison to the amount spent on other things of lesser value. Black Friday is starting early, as many stores have extended it into the Thanksgiving holiday. Folks will be walking away stuffed from Turkey tables to go out and attempt to satisfy other cravings. We are a consumer culture and pay a price for it. Loss of creativity, loss of self. Our endless consumption of meaningless things, leaves us craving more and destroying the planet in the process. This year, instead of heading for the mall, head for the basement or garage workshop instead. Instead of being engaged with rude bargain hunters, you will discover a new life. Thanksgiving and Black Friday are early this year, leaving us a number of making days prior to the Christmas holiday. A black Friday sale you may not want to miss offers 12 in. handscrews like the one used to make a bench vise in yesterday's post for $9.99 ea. Buy 4 to qualify for free shipping. http://www.rockler.com/wooden-handscrew-clamps-clamps Four of these clamps and a bit of effort would get 4 students busy working in your shop. For years before I had a workbench with a woodworking vise I used hand screws to hold drawer sides for cutting dovetails. For those unfamiliar with hand screws, they are an ages old form of clamp used by woodworkers. They range in size from 6 in. long to 12 in. and longer. A couple of them clamped to a workbench can serve in place of a bench vise and provide an amazing amount of holding power. The wooden jaws will not damage delicate stock, and can be adjusted to irregular shapes. 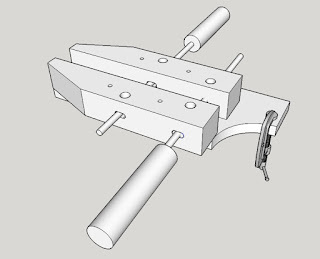 Now, with some schools wanting to try a re-introduction of woodworking, I've come up with a simple woodworking vise based on the readily available wood bodied hand screw. The idea is shown in the illustration, and it allows woodworking to be done on a table top or desk. 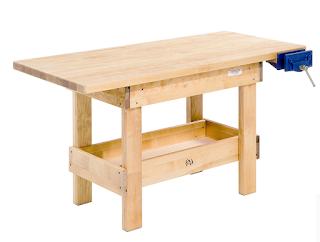 With this tool, woodworking can be done in any classroom provided other tools are supplied. A twelve inch hand screw can be purchased new for under $15.00 and smaller ones are available for much less. 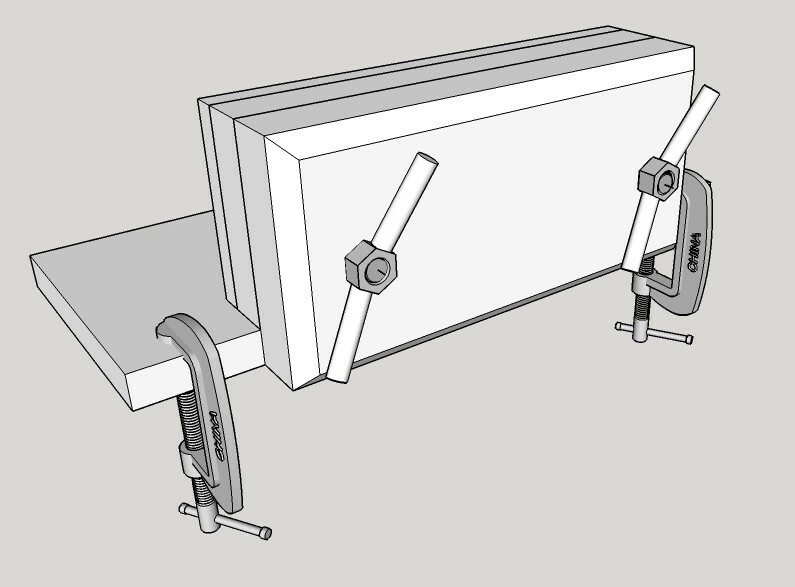 Two "c" clamps are also required to secure the hand screw table vise to a table or bench. A vise is the key to safe use of hand tools, and I believe this one will assist schools in getting their students started. More details will be shown after Thanksgiving. Yesterday as our students were involved in Trashathon, picking up road side trash as a community service project, I went to ESSA to get another step completed on the Bevins Skiffs. I am developing various parts as a kit, so that my students can be successful in our boat building project. They would not be involved without my leadership, and they will not be successful without my having done some of the complicated stuff. The parts for the day were center frames. The center frames require precision and careful thought that will not happen in a class full of kids. I had cut the parts from white oak and quickly learned the difficulty involved in hammering bronze ring shank nails into oak. Even with a pilot hole, the task proved impossible and rather than go home for a larger drill, I simply remade the parts from Catalpa. The photo shows the template for the center frame, the template for the gussets, and a gusset being nailed in place with Sikaflex adhesive and 1 inch bronze nails. 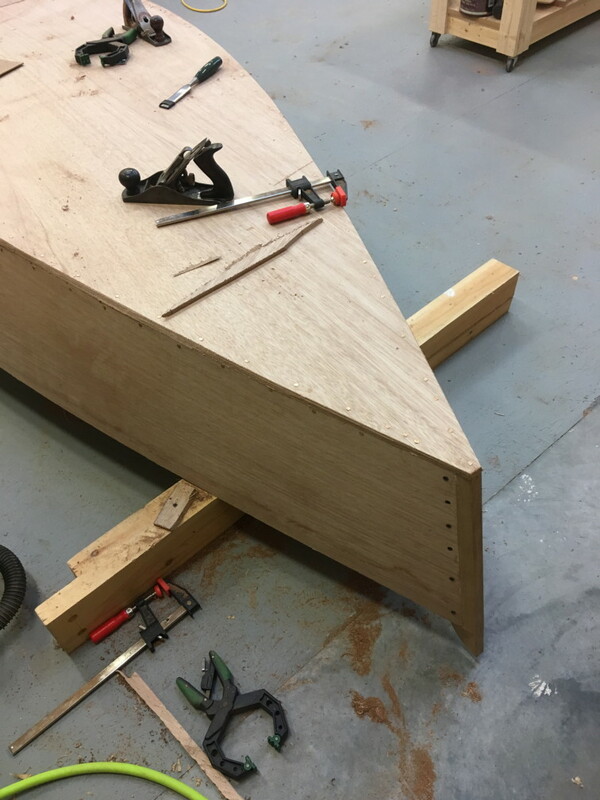 The Catalpa, gussets, nails and glue provide a strong midpoint around which the sides will bend to form the shape of the boat. 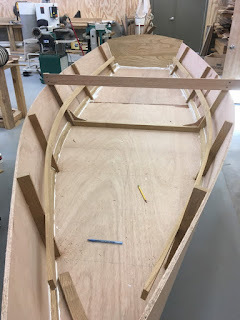 My hope is that by December 4 we will be ready to begin forming the boat from the various parts, sides, stem, transom, center frame and bottom ply. Starting on that day, many hands will make light work. My first, second and third grade students have been busy making Barbie clothes, so I got an old 1950's Singer SewHandy sewing machine tuned up for their use. It was not working so I studied the mechanism, took it apart, put it back together and got it working just right. Many years ago, my sister Ann had gotten a child's sewing machine as a gift. She was or seven and I was 4 or 5. I took it apart and it never worked right again. Perhaps my making this one work, and providing it to a classroom of very young fashion designers will make up in some small part for my earlier failure. When I left school for the day, one of the girls had already used the machine to make a pillow. Every elementary school classroom in America should be equipped with such wonderful machines and the chance to use them. In 1988, AFT President, Al Shanker, voiced his support for charter schools. His hope was that a new school model, judiciously used, would be an incubator of innovation. Yesterday I shaped the 3 remaining boat sides. I laid the carefully shaped first side as a template over the remaining three and used a saber saw to cut just outside the line. Next, I used a template following router bit to rout the clamped together bundle of sides to be exactly the same shape. I also planed and cut the chines to their required size and shape and then formed the center frame gussets. My objective is to develop the parts of the boat into kit form as there are a number of steps for which the students have not developed sufficient skill or experience. The photo shows a pair of center frame gussets, made to hold the parts of the center frame together. Today at the Clear Spring School, my elementary school students will make toys for distribution to kids through our local food bank. I get questions on occasion about the Clear Spring School, asking whether it is a charter school. No, it is not. It receives no public funds and does nothing to cost the tax payer or take funding away from our local public schools. Clear Spring School is an independent school accredited by the National Association of Independent Schools (NAIS) and the Independent School Association of the Central States (ISACS).